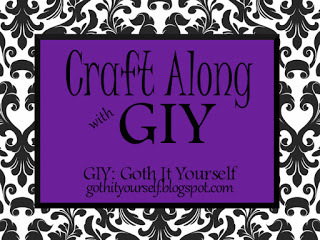 It's December and time to wrap up our first year of Craft Along with GIY. During December, I will work on a craft project. Around December 29, I will post my completed project. You can share a link to your project on that post or at any time during the month on this post. I will compile the links on the Craft Along with GIY page. You're not making it at all challenging, are you? Good luck with your project and wait for my brownie recipe in a few days (if I don't forget to post it). I need something easy because life is a bit stressful right now. Ok...anything goes...I can do that! lol I TRIED to think of a favorite thing for November...and then boom...the month's over! November did seem to fly by! Anything goes works for me!!! Wow! What a variety of crafts! :) Thanks for participating. Nice work! Thanks for participating.